Production: General Films; Eastmancolour, 35mm; running time: 121 minutes. Producer: Ravi; screenplay: Adoor Gopalakrishnan; photography: Ravi Varma; editor: M. Mani; assistant directors: Meera, Mohan, Babu; art director: Sivan; music: M. B. Srinivasan; sound recording: Deva Das, Chandran, Suresh; costumes: Ganeshan. Cast: Karamani ( Unni ); Sarada ( Rajamma ); Jalaja ( Sridevi ); Rajam K. Nair ( Janamma ); Prakash ( Janamma's son ); Sonan ( Estate Manager ). Variety (New York), 10 February 1982. Daney, Serge, in Cahiers du Cinéma (Paris), March 1982. Pulleine, T., Monthly Film Bulletin (London), November 1984. Dissanayake, W., "Self and Modernization in Malayalam Cinema," in East-West (Honolulu), June 1987. Film a Doba (Prague), October 1989. "Not So Servile: Indian Films (Film Industry in India)," in Economist , vol. 331, no. 7863, 14 May 1994. Ganguly, S., "Mapping Interiors: An Interview with Adoor Gopalakrishnan," in Asian Cinema (Drexel Hill), no. 1, 1997. Tournès, Andrée, and Lucien Logette, "Pesaro 1997," in Jeune Cinéma (Paris), May-June 1998. Gopalakrishnan's melodrama hinges around the paranoic central character of Unni. Utterly dependent for the running of his home, and for his personal needs on his unmarried sister Rajamma, Unni demonstrates his pathological insecurities with, for example, a horror of getting mud on his spotless clothing, of cows entering his ancestral yard, and through his utter inability to intervene into—or even address—the growing difficulties posed to his family by a decaying feudal system. His elder sister arrives asking for a division of the family property; his coconut grove is invaded by thieves; his youngest sister Sridevi elopes with a flashy youth working in the Middle East. Eventually, when Rajamma collapses under the strain, Unni withdraws, literally like a rat into a hole. The motif of the rat trap is written large into the film. 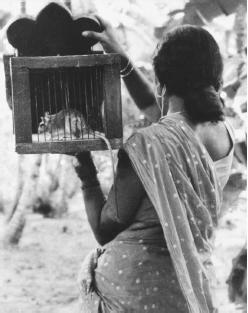 It begins with a whimpering Unni, calling for assistance when a rat enters his room, and replicates the early chase for the rat with the villagers chasing Unni himself in the film's end. This is Adoor Gopalakrishnan's third feature, his first in colour, and the film that established him as one of India's foremost independent directors. His first two, Swayamvaram (1972) and Kodiyettam (1977), were both melodramas, in which he worked with a specific, relatively unchanging style: with a few characters, an episodic narrative, and a style of quite literally shooting close to his central characters. He tries a larger expanse here, with a circular, slow pattern of shooting: typically through close-ups, tracking cutaways onto the different characters of his plot, thereby creating a series of narrative bridges from person to person, space to space. The spaces are patches of light and dark, and the soundtrack often consists of isolated units of realist effects and long silences. The result is a numbing, obsessive style, which is the only way his drama—which actually features something as abstract as a decaying feudal system—can focus on specific characters, and from them onto a loaded, obvious, repeatedly mentioned, metaphoric image of the rat caught in a trap. Crucial to the understanding of the film is the fact that Unni comes from Kerala's Nair community: the community that, together with the Namboodiris (Brahmins) formed the land-owning class of the state. Historically a military caste, later moving towards administrative service with the formation of a modern state in Travancore (now Southern Kerala), the Nairs are most distinctive for their matrilineal family structure "so loosely arranged as to raise doubts as to whether 'marriage' existed at all" (Nossiter, 1982). It was, as Nossiter shows, the end of a long era: "the ending of the warrior role, the abolition of agrestic slavery, the growth of a money economy, and the impact of Western education that combined to undermine the relevance of Nair traditions. The young men of the tarawad (joint family) were condemned to idleness; the management of the estates was more difficult; the expenses of customary practices more burdensome; and the competition of rival communities, notably the Syrian Christians and Ezhavas, more challenging." Most of these issues are directly illustrated by Gopalakrishnan's plotting: Unni's undefined marital status, his effort to keep Rajamma under his control when the three sisters—notably the eldest, Janamma— have clear rights to the family property, the thief Meenakshi's barely concealed effort to seduce the vacillating hero, Janamma's son Ravikuttan smoking idly behind the barn. In this, to some extent, the film adheres to an established literary genre pioneered by the noted novelist M. T. Vasudevan Nair, featuring the Nair community's decline in several existentialist stories (some of which he later adapted to film). The film, however, differs from that established genre in significant ways: particularly in consonance with Gopalakrishnan's controversial next movie, Mukha Mukham (1984). The Nair community, it is known, were among the strongest supporters of Congress, Congress socialist, and Communist parties during the turbulent 1940s that effectively saw Travancore catapult directly from a regressive, authoritarian feudal state into one ruled by a communist agenda. Gopalakrishnan, it is arguable, attempts in both these films, Elippathayam and Mukha Mukham , to create something like a backdated social reform for a people who saw no measured historical transition into modernity. It is as though he critiques feudalism in his state, but from a perspective that sees Kerala's emergence into modernity as a process that it had no means to comprehend. It is as though he now wishes to provide his people with that perspective through using his cinema, his slow visuals and soundtrack, so that the tragedy of Unni could itself be bracketed through a metaphor, for defining—but also evacuating—that tragic, existential, history of noncomprehension.